Guided Math That Works | A Site to learn about All Things Guided Math! You’re frustrated that your whole group math instruction always feels so chaotic and disorganized — no matter how many hours you spend planning. You’re struggling to differentiate during your math blocks, and you worry that you’re not meeting the diverse needs of your class. Your assessment results are showing that your students aren’t reaching mastery level (and seeing your students struggle with essential math skills breaks your heart). You’re constantly correcting your students’ behavior during math instruction, re-focusing their attention, and dealing with countless interruptions that derail and distract you. You’re curious about how guided math groups can streamline your teaching, settle down your students, and help dramatically improve their math mastery. Learning how to nail guided math is about to rock your world (and your classroom). It involves super practical, no-fluff professional development training that will get you taking action in no time… all in your coziest pajamas (and from the comfort of your home, too — more on that in a sec). The “one-size-fits-all” approach to teaching math doesn’t work — even though it’s been used for decades in classrooms all around the world! … but it’s been failing us — and our students. You may already be aware that whole group math instruction makes it nearly impossible to intervene with your struggling students and meet the needs those who are ahead of the curve. Which means you end your math blocks feeling hopeless, stressed, and exhausted — without much to show for it! Come back and do it all again the next day. Sound familiar? 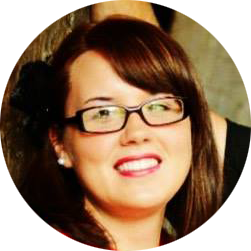 You’re just one of many smart, skilled, and passionate teachers who are struggling to find their groove with math. when you learn how to make guided math work for you, everything changes. But you’re not really sure what it’s all about, and if it would even work for you. You’ve got no idea where to start — and you’re overwhelmed enough as it is without implementing something new in your classroom! You’ve tried guided math groups before, but couldn’t find a flow that works — so you’ve returned to whole group instruction, and you’re doing the best with what you’ve got. Guided math groups, similar to guided reading groups, allow you to lead your students through your lesson plan one small group at a time. While you’re instructing one group, the rest of your class is working through activities on their own, until it’s time to rotate. … All with short and effective lessons that give your students the confidence and mastery they need to become successful mathematicians! …getting up and running with guided math can be tricky… if you don’t have a blueprint for making it work! Because the magic of guided math is in having a system that creates the consistency and routine necessary for your students to thrive. You owe it to yourself to try just one more time. Put simply? Guided Math That Works is the blueprint you’ve been looking for. for teachers in grades 1 -5. Your step-by-step blueprint for implementing guided math in your classroom — without the headache! In as little as just 5 days, you’ll learn a groundbreaking method that will transform your teaching and help your students achieve math mastery. Differentiate your instruction to meet the diverse needs and abilities of your class. Quickly identify gaps in your students’ math skills and scaffold your instruction as needed. Address confusion and correct mistakes early (and avoid surprises during assessment time). You’ll learn how to nail your guided math groups and turn your math block into a smooth and organized learning system — one that both you and your students will look forward to and enjoy! Get Guided Math That Works! Teachers need help getting your principal or administration onboard? 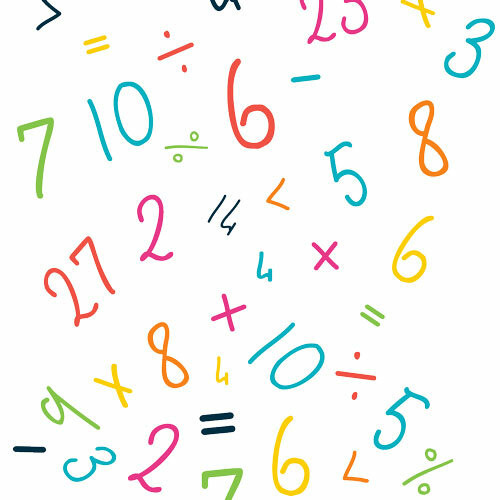 Share this interactive info-guide about Guided Math That Works with them! 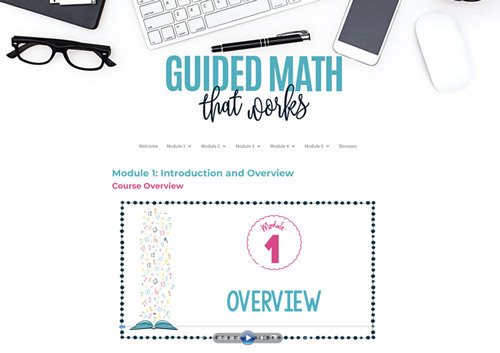 The Guided Math That Works Workshop consists of 5 video training modules and bite-sized tutorials. Or, do it at your own pace… preferably in your pajamas. You decide! Everything inside Guided Math That Works has been structured to get you taking action. We’ll cover the necessary theory to get you up to speed and give you a firm foundation in module 1, and then we’ll spend the next 4 modules digging deep into the action-focused, real-world advice that will make a serious difference in your classroom. Module 1 will give you a “big picture” introduction to guided math and how to implement this framework into your existing math block. We’ll review the overall philosophy behind guided math, and how all the bits and pieces fit together into a smooth and efficient system for getting your students up to mastery level — by teaching math to each of your students the way they need to be taught! 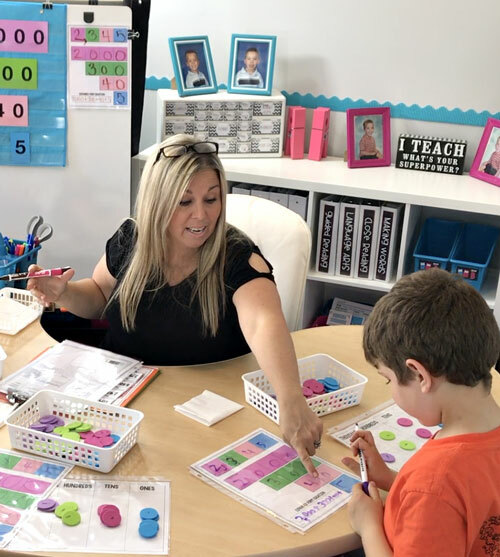 You may be surprised to hear that there is still a place for whole group instruction within the framework of guided math — you just need to learn WHEN and HOW to use it effectively as part of your guided math structure! 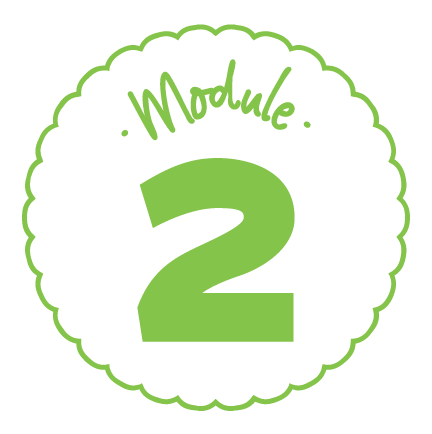 In module 2, you’ll learn how to use whole group instruction to introduce a new unit of study, and help your students build foundational skills through math warm ups and wrap up sessions, as well as number talks. You’ll also learn how you can use whole group instruction for more effective assessments — including formative and summative assessments — and when to use them. 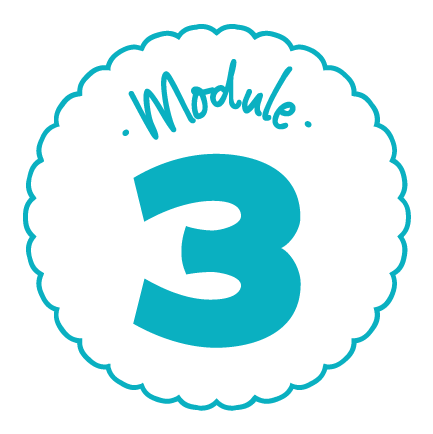 In module 3, you’ll learn how to plan, organize and execute your small group instruction with ease. I’ll show you how to plan your lessons and rotations using the C.P.A. approach, and how to create a classroom management plan — which is the most essential ingredient in helping your students learn your guided math routine and stick to it (so you can say goodbye to the days of dealing with constant interruptions, distractions and questions that derail your teaching). You’ll also learn how to informally assess your students in the moment by using anecdotal notes (this will save you SO much time when it comes to prepping for reports and parent conferences), as well as how to use your rotation chart for different scheduling scenarios. In module 4, I’ll show how I set up and run my small group instruction station — which I call the “Teacher Feature” station. This is the rotation where you’re working directly with students and leading them through your lesson plan. You’ll also watch a LIVE video of how I run my small group instruction and keep things running smoothly! And, if you’ve ever wondered what the other students are doing while you’re teaching your small group, all of your questions will be answered in this module. I’ll show you how to set up “The Workbook Nook”, which is where your students go immediately after their time with you, to work independently. You’ll also learn how to keep your students on-track and engaged during their entire math rotation — which means you’ll deal with less interruptions and distractions and actually have the time and focus you need to teach effectively! Depending on the size of your class, your students will also work through additional rotations during your math block — I call these “Elation Stations” — and there are so many fun possibilities for how you set up your math stations! We’ll cover math rotation stations for problem solving, math journals, fact fluency and technology, and I’ll show you how to organize your stations to keep your classroom running like a well-oiled (and beautifully quiet) machine — without spending a heap of money on new materials and equipment! You’ll be up and running with guided math in 5 days flat! No fluff — just actionable, real-world strategies to streamline your small groups, eliminate classroom chaos and distractions, and help your students achieve math mastery. 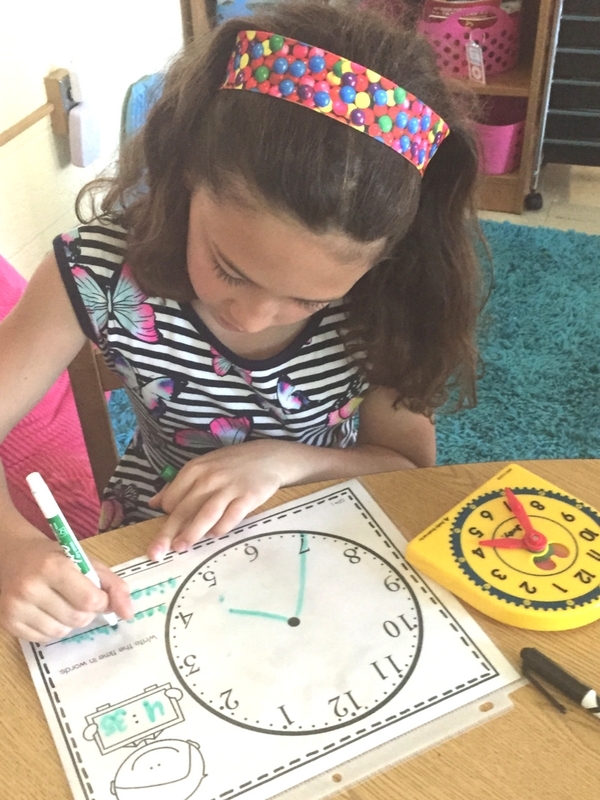 We know you’re short on time — and that’s why Guided Math That Works has been carefully structured to get you up and running with small groups quickly and effectively. The structure of the Workshop was created for busy teachers like you, who want a smart and simple system for making guided math work — without the overwhelm (or chaos) that normally comes from implementing a new approach in your classroom. You’ll be able to work through each module in about an hour a day, which means you’ll be up and running with your new guided math system in less than a week! Short on time? No problem — you can work through each of the modules at your own pace from the comfort of home. Each module ends with a brief “take action” challenge that will help you turn your new knowledge into action right away. 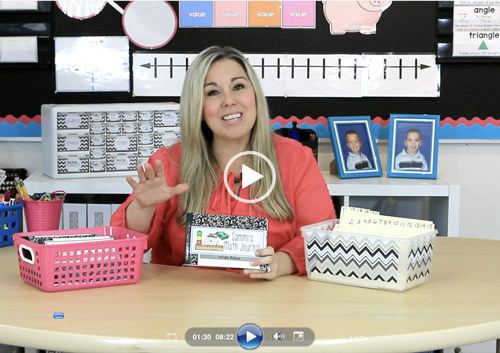 You’ll also love the behind the scenes videos and real-life examples of guided math routines, organization and setup! You’ll get access to plenty of worksheets and PDFs that cover key concepts, for you to reference at a glance and fast-track your learning. 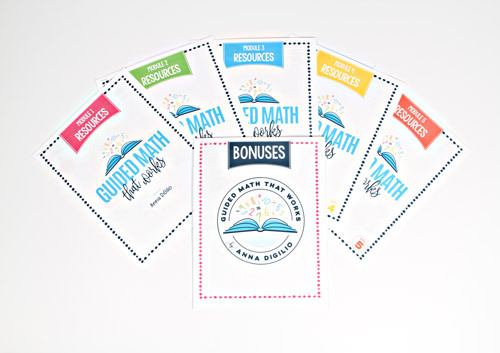 Your purchase also includes dozens of ready made printables and labels, to help you organize your math stations like a pro! Use this interactive math teaching tool to engage your students and implement Math Warm-Ups, Calendar Time, or Math Chats. Includes over 180 Vocabulary Word and definition cards to display during a specific unit of study to help students grow their mathematical vocabulary. 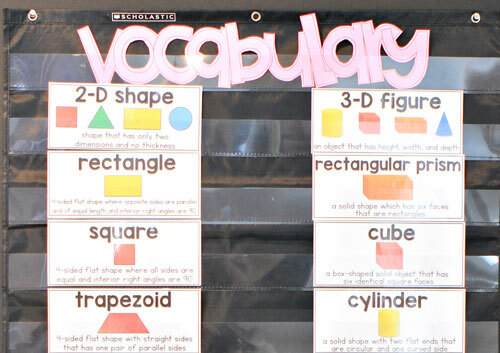 Display these on your Math Word Wall or in a pocket chart on your Math Focus Wall. Can be printed out and used in a pocket chart to organize your guided math rotation stations! Or, display the digital version on your smartboard and automatically time your rotations with chimes using powerpoint. Hi there! 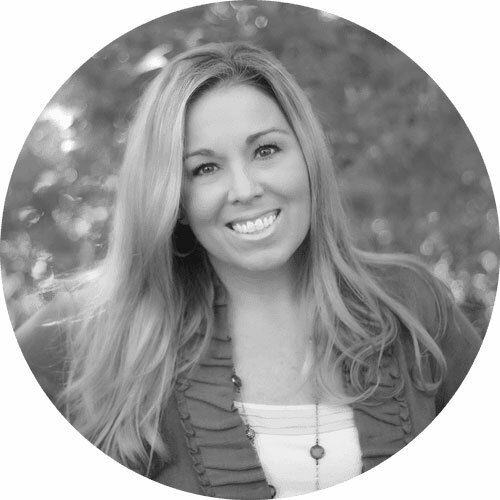 I’m Anna DiGilio, founder of Simply Skilled Teaching and the teacher, author and curriculum developer behind Simply Skilled in Second. I’ve been a teacher for 23 years and a curriculum developer for the past six. I’m also an adjunct professor at a local university, a die-hard chocolate lover, wife to a New York firefighter and mom to wonderful twin boys. 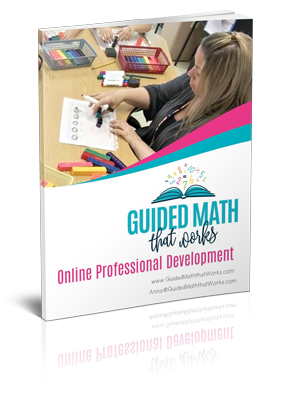 I created Guided Math That Works to help teachers implement a guided math framework into their classroom easily and effectively, so you can reach children of all ability levels and streamline your instruction. 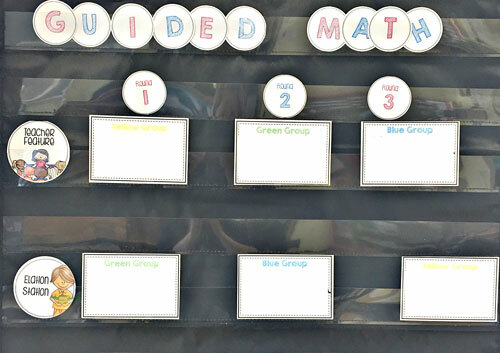 Guided math groups are incredibly powerful, but they can also be overwhelming — and that’s why I’ve structured Guided Math That Works to take the guesswork out of planning, organizing and executing your small group instruction. I’ve helped thousands of teachers implement this framework into their classrooms to engage their students and get them reaching mastery level — without the chaos! 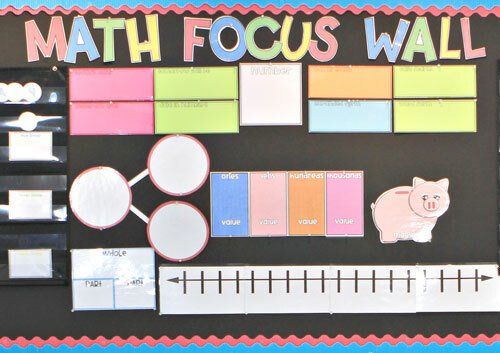 If you’re ready to start loving your math block, streamline your small groups, and see massive changes in your students’ attention, focus and ability levels, then Guided Math That Works was made for you. I’d be honored to see you join us inside the workshop and I’m so excited to help you achieve awesome results with guided math! I’m so confident that what you’ll learn inside Guided Math That Works will give you everything you need to transform your math block, streamline your instruction, and help your students achieve math mastery that I want to make it as easy as possible for you to say YES and experience the difference yourself! 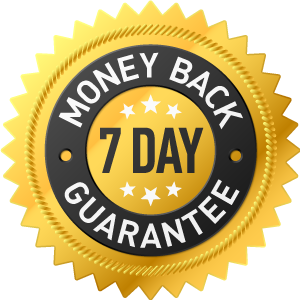 With our 7 day “love it or leave it” guarantee, you’ll be granted a full refund if you watch the video tutorials inside the guided math modules and decide that the Guided Math That Works workshop isn’t for you. Just complete this form within 7 days of your purchase, and we’ll process your refund, no questions asked. Please note that if you’ve downloaded any of our bonuses or PDFs, refunds cannot be granted, due to the instant and irrevocable access you’ll receive once they’re delivered. Ready to make your risk-free investment in Guided Math That Works? Select either the single teacher license or school/district license by clicking the buttons on this page, and follow the prompts to complete your payment. Within 15 minutes, you’ll receive an email with your login details to your online learning dashboard, filled with actionable video training and tons of step-by-step resources to get you up and running with guided math. 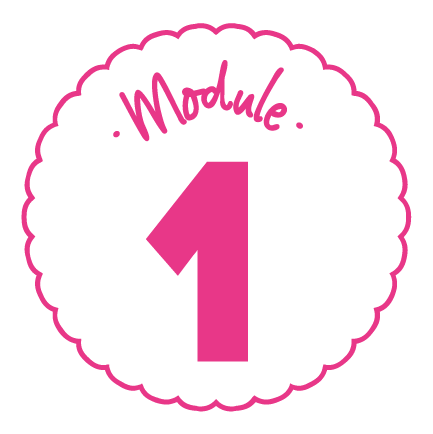 Login to your members dashboard, accessible from any tablet or computer, and dive into the welcome video in Module 1 to get started. You’ll be able to begin implementing your new insights this week! Get Guided Math That Worsk! Guided Math That Works is an online professional development workshop for teachers of grades 1-5. 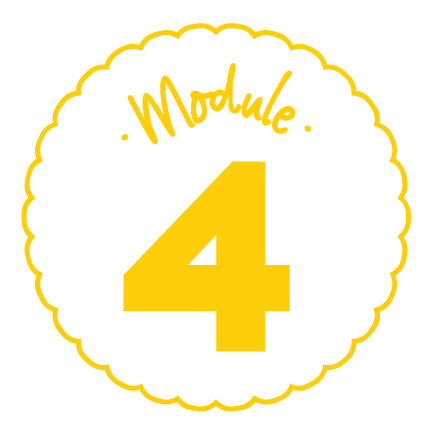 It is a 5 module course that contains 24 video-based lessons that include a workbook for each module and resources to help you implement the course materials. 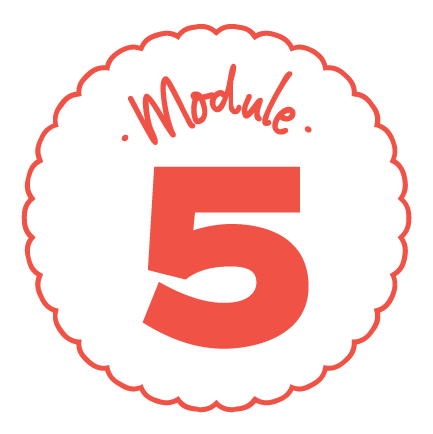 Once you’ve completed your purchase, you’ll receive your login details within 15 minutes, which will allow you to access all of the course content via our online learning dashboard. If you’re interested in School/District licenses you can download an interactive download an interactive PDF here to share with your principal or administrator. … Then Guided Math That Works was made for you! If you’ve tried guided math before and couldn’t find your groove, then the blueprint you’ll learn in Guided Math That Works will make all the pieces fit together and give you the smooth system you need to run your small groups with ease. Will this work with my existing math curriculum and state standards? YES! Guided Math That Works is the perfect companion to any curriculum, and will assist you in following state standards with the rigorous, effective and streamlined approach you’ll learn to teaching guided math. 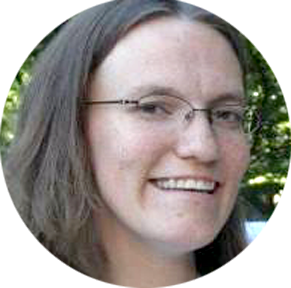 What you’ll learn in this workshop is a framework for making guided math work for you, no matter which curriculum or teaching material you’re already using. How is this different to the Guided Math Curriculum, activities and resources I can purchase through your Teachers Pay Teachers store? The Simply Skilled Guided Math Curriculum and our resources available through Teachers Pay Teachers are a great accompaniment to The Guided Math That Works workshop. Whereas our Teachers Pay Teachers resources and Guided Math Curriculum provide specific activities for teaching guided math, the Guided Math That Works workshop is the first of its kind: a learn from anywhere, at your own pace, professional development blueprint for nailing how you plan, organize and run your small groups. 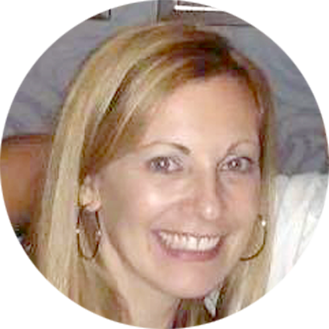 Teachers have consistently told us that getting a grip on guided math instruction felt overwhelming and difficult — and the Guided Math That Works workshop is here to give you a framework and a method to the madness that causes so many teachers to give up on guided math before experiencing the incredible benefits it offers. Yes, school districts can pay with a purchase order. Simply contact our service department at service@simplyskilledteaching.com and we’ll help you arrange that. Yes — with our 7 day “love it or leave it” guarantee, you’ll be granted a full refund if you watch the video tutorials inside the guided math modules and decide that the Guided Math That Works workshop isn’t for you. Just contact our service department at service@simplyskilledteaching.com within 7 days of your purchase, and we’ll process your refund, no questions asked. Still have questions, concerns, or anything you’re not sure of? Still have questions, concerns, or anything you’re not sure of? Complete this form and we’ll answer your question ASAP. Get instant access to Guided Math That Works Today! Thank you so much for your interest in Guided Math That Works Site! We will let you know when enrollment for members will open again! Success! Thank you so much for joining our Wait List!